Classically trained in his native France, Jean-Claude honed his skills traveling the world. He settled in Manhattan out of curiosity and a sense of adventure and became the Executive Pastry Chef in such prestigious establishments as The Rainbow Room, Les Bernardins and The River Club. Jean-Claude and his wife Annette proudly look forward to the 19th anniversary of their Warwick shoppe, which has received numerous accolades – Zagat-listed for the past decade and most recently awarded for 2012/13, “Best of the Hudson Valley,” “Best Bakery” by Straus Newspapers and most importantly, the sincere appreciation and notes from their very loyal patrons. They have a second location in picturesque Greenwood Lake, New York. As noted in Zagat, Jean-Claude’s is your “premier source for special occasion cakes.” Whatever the occasion, consultation with a knowledgeable and friendly staff is always provided to help you make the right choices for your memorable celebration. According to the Academy of Nutrition and Dietetics, "moderation is the key to healthy eating, and indulgence in sweets is part of a healthy lifestyle." So when you indulge, make it Jean-Claude's gold standard of using only the finest, purest ingredients: local farm-fresh fruits, pure grade AA butter, and rich, dark chocolate bursting with natural phytochemicals, or "flavanols" (an antioxidant which may improve blood flow, reducing the risk of cardiovascular disease). 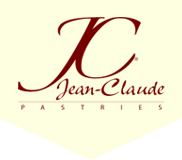 Jean-Claude's Artisan Bakery is where life's favorite indulgences are guaranteed to always be delicious, pure, fresh, and never processed! - Janine Killeen, RD, CDE, CDC, Registered Dietician, Certified Diabetes Educator, Certified Dietician.